Long-lasting, high-performance water filtration for great-tasting, healthy water throughout your entire home for up to 1 million gallons or 10 years. Premium Rhino Whole House Filter with SimplySoft Softener + Descaler & UV is rated 4.7 out of 5 by 531.
with cleaner, healthier air. Chlorine and volatile organic chemicals (VOCs) can evaporate in shower steam, contaminating the air you breathe. Instantly improve your indoor air quality by filtering the water throughout your home. Top chefs know that using filtered water produces stronger flavors, quicker cooking times and all-around optimal results in the kitchen. Reduce your body's exposure to harsh chlorine and synthetic chemicals that can cause damage and excessive drying. Bathe yourself in Aquasana filtered water for noticeably healthier, more moisturized skin and hair. Intelligently engineered to maximize potent filtration media for ultimate performance. The Aquasana Rhino's unique upflow, dual tank design increases water contact time with contaminant grabbing media and prevents clogging or media channeling. System tested and proven to remove 97% of chlorine for 1,000,000 gallons or 10 years. 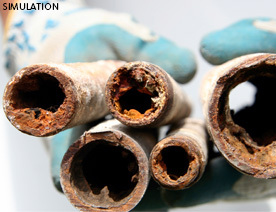 Scale and corrosion without SCM protection can build up in your plumbing and appliances. Protect your home and appliances with an Aquasana SimplySoft whole home solution. Scale Control Media uses water flow to naturally alter the structure of hard mineral ions into a crystal structure that prevents the minerals from binding and forming scale buildup. 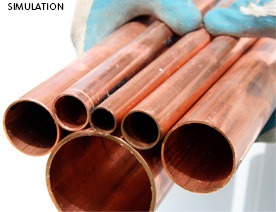 SCM salt-free technology is proven to reduce scale on internal pipes and plumbing. Unlike salt based softeners, Aquasana SimplySoft will not demineralize your water, harm your pipes with harsh salt, or put excessive amounts of sodium waste into our communal water supply. Worried about boil warnings because bacteria and chlorine resistant cysts are making your water non-potable? Get total home protection to safeguard against bacteria and viruses that may be present in your water. Powerful UV filtration kills 99.99% of viruses, bacteria like E. coli, and chlorine resistant cysts like cryptosporidium and giardia. Upgraded components to make your system professional grade. Brass fittings Easier to install and maintain over time. Sub-micron post-filter Provides added protection from organic particles and microscopic cysts. 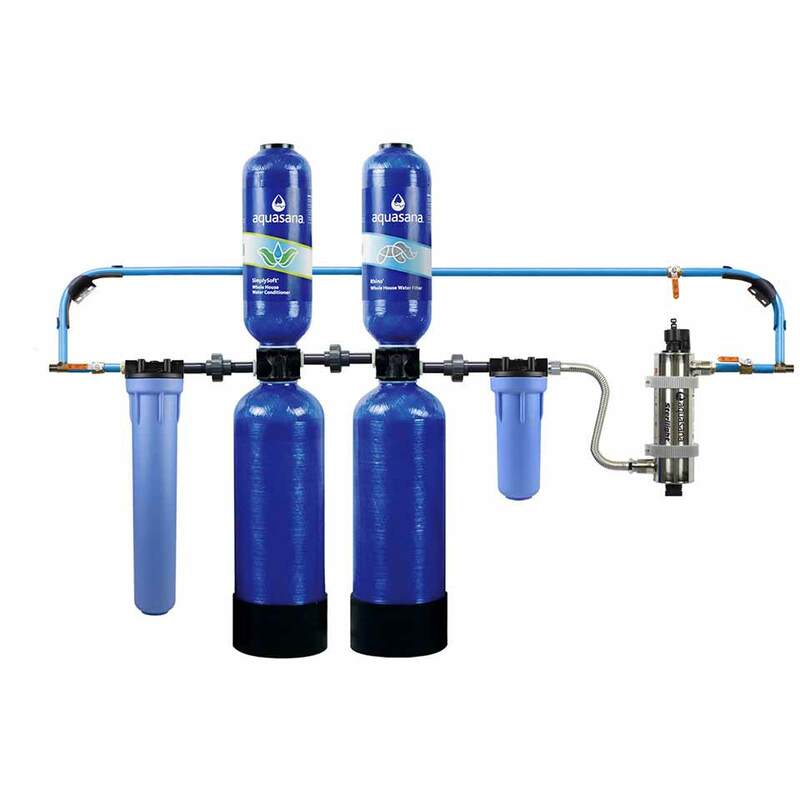 Base install kit for EQ-1000 includes: plastic fittings and a 20” pre-filter. Does not include brass fittings, sub-micron post-filter or bend supports and shut-off valves for by-pass loop. Our one million gallon whole house water filter system is comprised of carefully sequenced stages, each with its own unique formula of high-potency, contaminant-grabbing media and filtration. Easy to install, replace & maintain. Does not require backflushing or drainage lines. catches rust, sediment and silt. prevents minerals from binding and forming scale build-up. reduces chlorine, water soluble heavy metals, and scale and inhibits bacteria and algae growth. reduces herbicides, pesticides and other chemical compounds that may be present. reduces any remaining sediment and organic particles down to 0.35 microns. further protects against bacteria and viruses that could be present in your water. Rated 5 out of 5 by No more bottled water! from What would you pay for cleaner water? The system showed up relatively quickly. I had a plumber install the system because our water is very high pressure and since this is a ten year setup we felt it would be better to have a professional. They used brass and copper in place of some of the “pro install kit” items for a better and safer install. The cost was more than expected but well worth it for peace of mind. Shower, dishwasher, washer, brushing teeth, etc now using chlorine and metal free water. Being able to drink clean tasting water anywhere in the house is such a pleasure. Already had a friend buy the same system. Rated 5 out of 5 by JoeR from Amazing filtration system Amazing difference with whole house filtration system. You can drink water from the tap, it tastes great. Yellow water is now crystal clear, cleaner clothes and toilets. Rated 5 out of 5 by Wattss from Great Water We have noticed a big difference in taste, color and softness. Rated 5 out of 5 by RickGJ from First impression of our Rhino Whole House filter The installation took our plumber about 6 hours. Before we switched over to the new system he took a chlorine test which showed a normal level of chlorine. Immediately after switching over and running water through all of the system, he did a follow-up test which showed no chlorine. We have noticed a tremendous drop in hard water residue. Rated 5 out of 5 by Gogo from Great product for the money spent Great product. I can tell the difference in water quality immediately. Relatively easy to install. One issue that I faced was air in the tap water. The micro bubbles eventually settle but I don’t like the look and feeling of airlifted water. Rated 5 out of 5 by AlbRick from Extremely Happy So far so good. No more mineral deposits and the water tastes great! Rated 5 out of 5 by Barb is picky from Unbelievable Improvement The filter was installed about 3 weeks ago and we can’t believe the difference. No odor or disgusting taste, no running to the kitchen for filtered water. Rated 5 out of 5 by Art Marker from So glad I installed this system! The water tastes so much better and my skin felt soft again within the first 3 days of the system being operable. I love the fact that I can drink water straight out of my faucet now and it no longer smells like rotten eggs. I am looking forward to less wear on our washer, dishwasher and faucets! Rated 5 out of 5 by Tony in FL from Whole house filtration This system is very clean and organized. I feel our water is well filtered and contaminant free. What is the difference between city water and well water? City water is pre-treated to make sure it is free of bacteria, viruses and common contamination sources. City water is regulated so that the contaminants regulated by the EPA fall within or below EPA guidelines. Well water is untreated water from an underground aquifer that is pumped into a house. Well water may contain higher than average levels of iron or sulfur, or other contaminants. Why are whole house water filters considered point of entry systems? The filtration system is installed at the point where the main water supply enters the home, delivering filtered water to all subsequent outlets. Hard water contains a higher than average amount of dissolved minerals (primarily calcium and magnesium), and a higher concentration of multivalent cations (Ca2+ and Mg2+). Hard water is mostly a nuisance as these dissolved minerals can clump together to produce scale, which can harm your internal pipes, plumbing, and home appliances. No, hard water is more of a nuisance than a health issue, and is not considered contaminated. Most water sources in the USA are considered hard. Is hard water safe to drink? Yes, hard water is healthy enough to drink. The most recognizable trait of "soft" water is how much more soap lathers, as opposed to hard water, in which soap lathers less due to the higher concentration of minerals. Water softeners reduce the negative effects of dissolved minerals in water that can clump together and produce scale buildup. Does having soft water mean it is clean water? Soft water does not mean clean water. Your water can be soft and still have contaminants present in the water. Is it safe to drink? Yes, soft water is considered potable as long as the water has not passed through a sodium-based water softener. Drinking water from a sodium-based softener increased your daily intake of sodium, which can lead to health problems in sodium-sensitive individuals. What is a salt-based water softener? A salt-based water softener is a system designed to remove/reduce calcium and magnesium from the water by exchanging it with sodium. This is done through an ion exchange resin that alters the molecular structure of the calcium and magnesium from a divalent ion to a univalent ion, making the water "softer." Do softeners reduce chemical contamination? Softeners do not remove chemical contamination themselves, but softeners sometimes have a carbon filter working in conjunction with the softener to treat contamination. What type of filtration media do you use in the top tank of the EQ-600 and EQ-1000? The top tank contains a KDF-55 medium (A mixture of 55% copper and 45% zinc mineral alloy) for the reduction of chlorine and certain heavy metals, as well as a crushed mineral filter stone to enhance the water's pH and control scale on internal plumbing. Both media are bacteriostatic, which means they prohibit bacteria and algae from growing or developing within the system. What type of filtration media do you use in the top tank of the EQ-WELL-UV? The EQ-WELL-UV top tank contains a KDF-85 medium (A mixture of 85% copper and 15% zinc mineral alloy) for the reduction of hydrogen sulfide and heavy metals like iron, as well as a crushed mineral filter stone to enhance the water's pH and control scale on internal plumbing. Both media are bacteriostatic, which means they prohibit bacteria and algae from growing or developing within the system. KDF stands for kinetic degradation fluxion, which is a redox filtration medium. KDF uses a unique combination of copper and zinc that creates an electrochemical reaction. During this reaction, electrons are transferred between molecules, creating new, harmless molecules and compounds. Free chlorine, for instance, is changed into benign, water-soluble chloride, which is then carried harmlessly through the water supply. Similarly, some heavy metals* such as copper*, lead*, mercury* and others, cling to the medium's surface, thus being effectively removed from the water supply. What type of media is used in the bottom tank of the EQ-600 and EQ-1000? The bottom tank contains a carbonized coconut shell medium that reduces synthetic chemicals and VOCs. What type of media is used in the bottom tank of the EQ-WELL-UV? The EQ-WELL-UV bottom tank contains a carbonized coconut shell & catalytic medium that reduces synthetic chemicals, hydrogen sulfide gasses and VOCs. What percentage of chlorine do Aquasana Whole Home Systems remove and for how long? The EQ-600 is certified by NSF International to reduce >97% of chlorine for 600,000 gallons or 6 years. The EQ-1000 is also tested to reduce chlorine by >97% for 1,000,000 or 10 years. Do any of your whole house filters remove calcium? Our whole house filters do not remove calcium. To reduce calcium or other hard mineral buildup, we offer whole house filter + salt-free conditioner combo systems. What is the flow rate of aquasana whole house filter systems? All Aquasana Whole House Systems perform at 7 gallons per minute (gpm). Will I experience a drop in water pressure after installing the whole house filter? As long as your home is less than 3500 sq. ft. and you have 3-1/2 bathrooms or fewer, you should not experience any noticeable drops in pressure. If you have a larger home, we can build a custom system to deal with the typical water capacity of your home. What is chloramine, and do your whole house filters remove it? Chloramine is a disinfection agent comprised of chlorine + ammonia used as an alternative to chlorine in some city water treatment facilities. They use chloramines for two big reasons: (1) chloramine is less reactive, so it does not create as many disinfection by-products as chlorine, and (2) chloramine is more persistent, and remains in the treated water through the distribution network all the way to the taps in the homes the treatment facility serves. For customers with chloramine in their water, we offer the EQ-400. The EQ-400 features upgraded catalytic activated carbon media , which has a higher surface point and is able to handle the aggressiveness of the chloramine for a longer period of time than the standard coconut shell carbon used in the standard whole house systems. The EQ-400 is available for purchase by calling the Aquasana Water Specialists at 866-662-6885. Do the whole house systems remove bacteria or viruses? Our EQ-WELL-UV Well Water Whole House Filter comes standard with the Aquasana Sterilight UV Filter specifically designed to kill bacteria and viruses. For our city water whole house systems (EQ-600 and EQ-1000) that do not come standard with the UV filter, we offer the Sterilight UV Filter as an add-on item that easily attaches to any of our whole house filter systems. Do I need a licensed plumber to install the whole house filter? Yes, Aquasana recommends you have a licensed plumber install the system for you, to ensure that the system is installed properly. Since most licensed plumbers carry insurance to cover any damages caused by an installation error, having a licensed plumber install the system for you will give you the security that the work was done properly and that the installation is backed up by the plumbing company's insurance plan. Not having the system installed by a licensed plumber will void the warranty of all our whole house filter systems. Is UV effective against protozoa such as Cryptosporidium and Giardia lamblia? Yes, as a result of recent findings by academic researchers, it has now been proven that UV is the best available technology to treat these protozoan cysts. In addition, the dose levels required to inactivate these cysts are actually quite low: less than 10 mJ/cm2 for 99.9% reduction of both Cryptosporidium parvum and Giardia lamblia. Why do I need to disinfect my water supply? Disinfection is recommended for all water supplies that are not protected by a municipal water source. Unfortunately, due to the uncertainties that exist with our current water supplies, we can no longer rely on the fact that our water supplies "may be safe". By providing your own disinfection, you are taking the responsibility of ensuring the safety of your water supply for you and your family. Does UV remove E. coli? Yes, E. coli requires a UV dose of between 6 to 10 mJ/cm2 to achieve a 4-log (99.99%) disinfection. This is well within the capabilities of our UV systems which actually deliver a minimum of 30 mJ/cm2. Do I need to disinfect my municipal water supply? Our municipalities work very hard to provide safe, disinfected water for their customers. This is quite evident when you consider the difficulties involved in providing safe drinking water through a vast distribution network. If you use water that comes from a municipal water supply and wish to provide your family with added "peace of mind", then we believe a UV system acts as an inexpensive insurance policy against the possibility of drinking bacteriologically contaminated water. How much does it cost to operate UV systems? UV systems are extremely economical to operate. A typical 10 gpm whole house UV system operates on the same power requirements as a 40 watt light bulb! No, UV is a physical disinfection process. It does not change the taste or odor of the water. It simply provides safe, reliable disinfection and adds nothing to the water. Should I shut my UV system off when I am not using it? No, the UV system should be left on whether you are using the water or not. The lamps age regardless of the amount of water drawn through the system. By leaving the unit on, you will eliminate the potential problem of having contamination pass through the system while the unit is off. However, if water is drained from your disinfection system (e.g. winterizing), your UV system must be switched off. What are the annual maintenance requirements? UV lamps have a useful life of approximately 9000 hours which means that the lamps require annual replacement. The UV light may offer illumination beyond 1 year, however there will not be enough UV energy to provide adequate disinfection. Proper maintenance of any pre-treatment is also required. The sleeve should be cleaned at least once a year. Do I need to consider the quality of my water prior to the UV? Is you water treatment system capable of removing or reducing dissolved silica from a municipal water supply?The concentration of dissolved silica in the Santa Fe municipal water supply can be as high as 40-50 ppm. How often do you have to change filters and how much are they? I'm looking something for a house of 8 bathroom, 6500ft2, What do yo recommend me? My biggest problem is chlorine. It destroys the carbon filters in the pitcher type filer. How does this stack up? If I am getting the 1,000,000 gallon whole house filter, what would need to be replaced after the 10 yr, 1,000,000 gallons? Also, with the saltless water softener and the UV features, will it resolve all hard water and the sulpher smell? † Pro-grade installation kit pricing and discounts are shown for 3/4" pipe fittings. Additional charges may apply to upgrade to 1" fittings.